With over 20 years of experience in the industry, Patrick designs outdoor spaces to express the beauty of nature and to celebrate the sculptural qualities of landform. 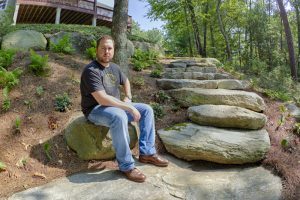 Following earning his Bachelor’s of Landscape Architecture at the University of Rhode Island, Patrick worked for a design/build firm in Jamestown, RI between 2000 and 2003 serving the company as an estimator, project manager, and designer. As the firm was small, Patrick gained valuable hands on experience in the field learning real world construction techniques and was exposed to unique obstacles and innovative solutions. Between April of 2004 and January of 2010 Patrick was part of the team at Katherine Field and Associates in Newport, RI serving the firm as a project manager and Sr. Landscape Designer. He managed and designed projects with budgets ranging from $50K to $3M and served the firm and clientele admirably. Infinity Design Group is a Landscape Architecture and Site Planning firm which is focused on residential landscape design, land planning, and project management. This is truly where Patrick’s passion lies, and where he can use his talent in an environment that suits him well and with which he can explore boundless creativity. Infinity Design Group takes design cues from each individual client and each individual site allowing designs to emerge from a collaborative process to create enduring, innovative landscapes which we nurture from inspiration through installation. Who is Infinity Design Group? Infinity Design Group, Inc. exists to benefit the lives of our clientele by refreshing the users of our outdoor spaces in body, mind, and spirit. We strive to inspire moments of optimism and tranquility through our attention to detail and regard for form and function. Our ultimate obligation is to provide value to our customers with consistently attractive, enduring, functional, and environmentally responsible solutions to their landscaping needs.